$22.50 NOW $12.00 (GST Included) Professionally designed resources enable teachers to embed them into their teaching and learning by creating an engaging context for the students. These inspirational and motivational resources enable teachers to establish a web of relationship within the classroom with a view of developing their student's mathematical competencies and identities. Feedback received on these resources have been extremely positive with teachers commenting on the usability, adaptability and its relevance to NZ curriculum. Large, colourful vinyl number mat that measures 50 cm x 70 cm (approx). Thick and long lasting mat which can be folded or rolled up. Features numerous suggested activities on addition, subtraction, numbers before, numbers after, ordering numbers, sequencing numbers, counting on, counting backwards and many more that you think of. Set of 20 laminated A4 cards. Numbers 1-20 in numerals matching with colour pictures. Number words both in English and in Maori. Ideal for exploring and building number sense. Brilliant resource for developing mental strategies in Maths. Great idea for wall display!!! Set of 10 laminated A4 playing cards with instructions on how to play. Very attractive and colourful cartoon caterpillar pictures with numbers. Active learning with number identification skills from 1-12. Fun game suitable for 2-10 players. Set of numbers 20 laminated die cut loop ice-cream cards. Matching cones with ice-cream. An activity for learning in a fun way. Great activity for connecting numbers 1-20 words with numerals. Fantastic activity to enrich mental Maths language. 100 pieces multi-coloured tokens for Number Bingo. 1 set pf playing cards that is very handy to teach numerous Math skills. Pack of 6 dice. Dotted dice for doing Maths activities and Number Bingo. $9.50 (GST Included) Description:GT Enterprise has taken a keen interest in the development of Numeracy Resou..
NOW $9.50 (GST Included) Description:GT Enterprise has taken a keen interest in the development ..
NOW $5.00 (GST Included) GT Enterprise has taken a keen interest in the development of Numeracy Resour..
$8.50 (GST Included) Number Set - Numbers 1-20Set of 20 laminated A4 cards. 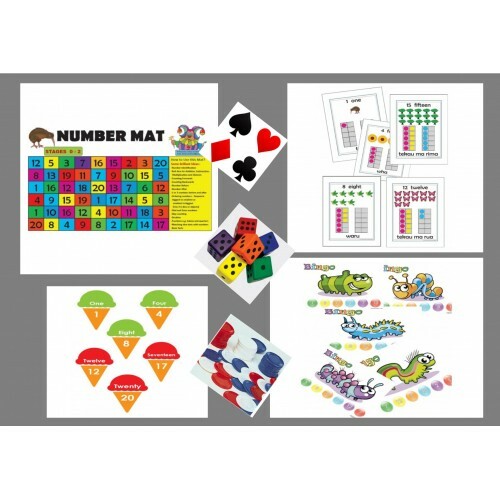 Numbers 1-20 i..
$4.50 (GST Included)Number Bingo SetSet of 10 laminated A4 playing cards with instructions on how to play. V..